Everything I Love This is the story of a musical treasure that was about to slip away. Suppose three of Chicago’s most respected musicians--a singer, a pianist and an arranger--got together amidst full careers, to fulfill the arranger’s idea of a once-in-a-lifetime, no-compromises recording. Suppose they took several years, followed an unusually demanding creative process, brought in virtuoso performers, symphony players, and the wealth Chicago’s music scene for the project—a career’s bounty of brilliant friends, colleagues and collaborators. And, with life and luck, suppose the album got done barely in time for the pianist to hear it during the late stages of cancer. After that, only a small run of CDs was printed, for friends and fellow musicians at his memorial service. Suppose the story ended there. Where to begin? 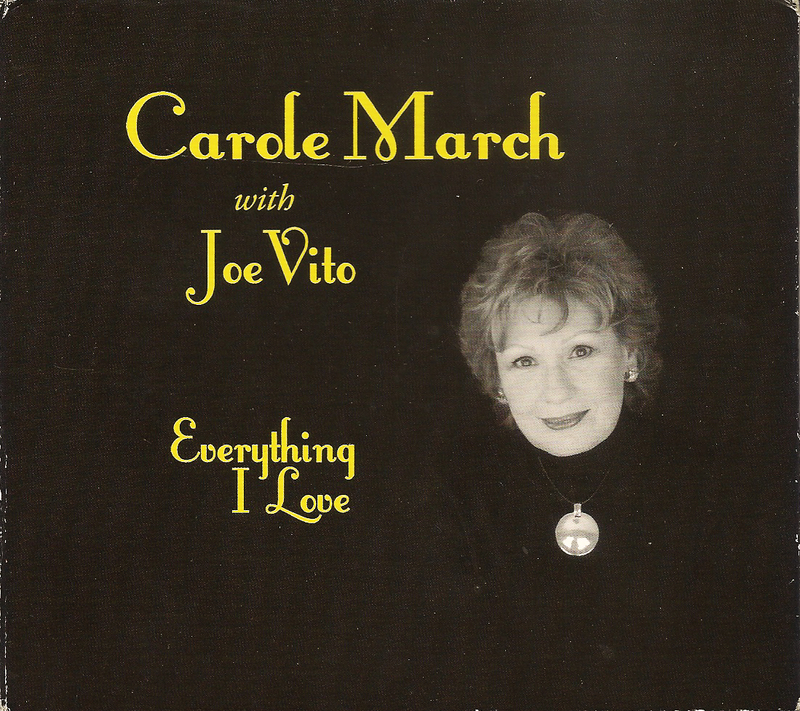 Joe Vito and Carole March met while performing for broadcasts at Chicago’s CBS affiliate. Soon they embarked on a joyous, devoted marriage, while each continued a busy, successful career at the top of the Chicago music scene. A random example of a schedule conflict for Joe: “The composer of the soundtrack for Lord of the Rings wants me to conduct a 100-piece orchestra on the same day I have a gig in Doc Severinson’s band from The Tonight Show.” Or, a nice recognition for Carole: she was chosen to perform at Luciano Pavarotti’s 50th birthday party. Good musicians? Res ipsa loquitur. Enter long-time colleague and friend Mike Pendowski. After years being in demand for others’ projects, he wanted, at last, to do an album where he had total artistic control: his creative design, his arrangements, his recording studio. Pendowski’s approach took the best elements of spontaneous, warm, small-ensemble performance, and transformed the result with creative, tailored arrangements. Step one: capture Carole and Joe’s skills and taste in a relaxed and comfortable way. How? Pendowski asked Carole and Joe to choose some songs they liked. As they searched through their favorites, Pendowski would record duo performances, with only Joe’s piano and Carole’s voice. Pendowski then used those warm, intimate duo performances as the basis for an unusual next step. 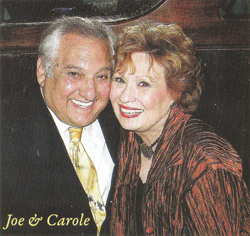 From the duo recordings, Pendowski created arrangements that were based on, and artistically faithful to, Carole and Joe’s performances. He worked his magic as an arranger and conductor to give a tailored, carefully crafted uplift to Carole and Joe’s interpretation of each song. No two are alike. The revised composition would then go to a second recording session, with Carole and Joe performing in the full arrangement. That’s what happened, with one exception. One day, Carole and Joe got the call to come record the final track for While We’re Young / Our Waltz. They arrived, and Pendowski started directing Carole. Joe asked what he should do. Joe laughed, sensing that some musician’s prank might be about to unfold. Instead, Pendowski explained why there was no part for Joe. He had transcribed every single note that Joe played on the original track. From that, he turned the resulting melody lines into vocal charts for an a cappella ensemble! The vocal arrangement from Vito’s piano harmony was so challenging that it took multiple recording sessions for the singers to lay it down. Carole describes her initial amazement when she first heard the piano harmonies re-created by voices. The remaining tracks, and the story of Everything I Love, will be released in chapters over the coming months. This is only the beginning! An audiophile, direct stream digital (DSD) version from the original master tape is planned after that. We hope you enjoy the music, and check back to this site as we add to the story. Carole March, Harold Fethe and others associated with this project will be sending updates via social media as the project continues.